Stepping into the spacious proportions of this new kitchen-dining room, the eye is drawn to a graceful bespoke glass display cabinet on the far wall. 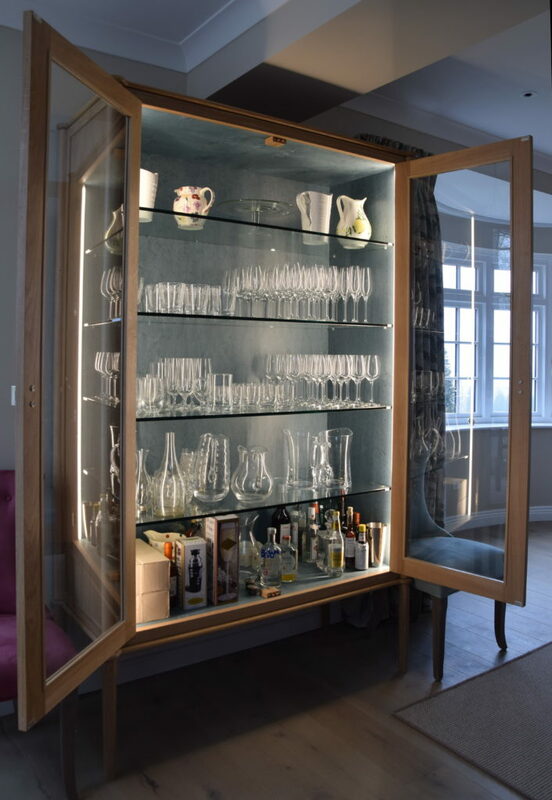 The client had wanted storage for glassware, a statement piece that could be moved to a new home in the future if needed, more a piece of furniture than simply a cupboard. 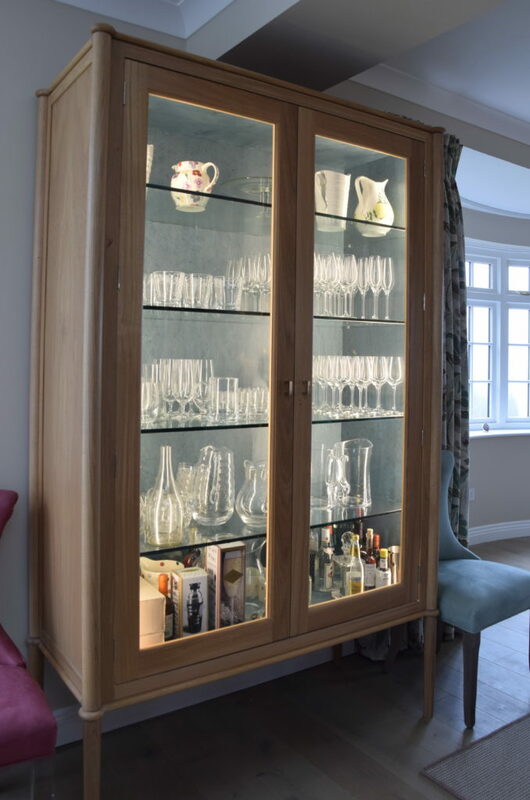 The resulting design for the glass cabinet had no specific historical reference but has something of the 1950’s simplicity, and perhaps a sprinkle too of Arts & Crafts style. The beautifully turned legs run the full height of the cabinet and a bullnose trim wraps around each corner at the top and bottom. The hidden internal LED lighting sets the tone for the evening, washing the kitchen and dining room with subtle light. The final key to the design is inside: the interior has been veneered with a rich, blue tinted birds-eye maple veneer. Contrasting beautifully with the white oiled oak of the exterior, the veneer brings a depth and texture similar to a fabric lining and is altogether a very sophisticated finish to a stunning piece of contemporary furniture. This cabinetry display piece was commissioned as part of the design for a new kitchen for a family home. The architectural brief was to find a solution to reorganise the space in the centre of the house for a new kitchen. At the back of the house, the previously gloomy kitchen couldn’t have been in a more awkward place, while the dining room was separate and equally cold and dark. Melanie Latham of Affinity Architects explains, ‘Our approach looks at the flow of a house but we also help clients think about their footprint on the planet in a variety of small ways. Here, we started with the fabric of the house: if a house is efficient to run, clearly a client won’t need to waste energy. By taking down a central wall, Affinity Architects created space for an open plan dining-kitchen on the sunnier side of the house, connecting the two parts via a cupola-roofed octagon study at the corner of the new room. Melanie’s vision for this cupola was to be a small part of the new build that would link the cooking and dining areas and prevent the kitchen from becoming too box-like. Light was an important factor in the renovation. She comments, “This is a very deep room so, in order to keep it light, we also added a roof lantern over the kitchen sink which works really well. It made a great difference to the quality of light in the room and provides uninterrupted natural light in daytime”. 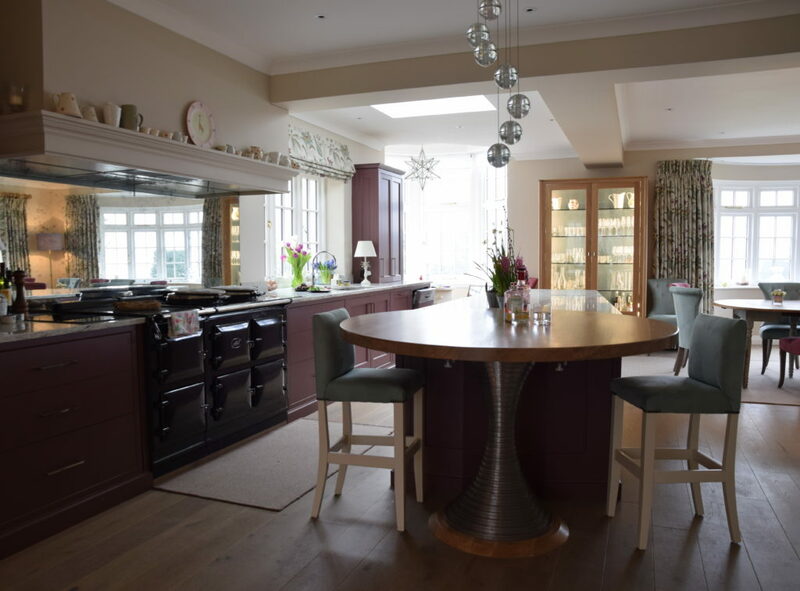 The success of the renovation project is undoubtedly the resulting stunning new living kitchen, designed and built in the Guild Anderson workshops, fitted and hand-painted on site. The result is a beautifully appointed central family room full of light and with far reaching views over the gardens. The design team unanimously found the client exceptionally easy to work for, an especially super client because she was trusting and willing to take advice. “She didn’t try to overanalyse and worry too much or be overly meticulous on detail or try to leap ahead. Although sometimes this isn’t possible, you need to take one step at a time and the right plan becomes apparent: it is a sequence.” Melanie observes, “Design is very much about trust, if trust is not there, the situation is almost impossible to create something successful. You are effectively entrusted to spend someone’s money, so you don’t do this lightly – you are always conscious of making sure you are going in the right direction. It is not about not spending but about spending wisely. Design can be a leap of faith for both sides, and the result can be something truly lovely’. Guild Anderson’s starting point for this project was working out what worked for the family. “The best design solutions are an evolution of ideas and a creative partnership between ourselves, the client and their design professionals”, Nick Anderson says. The style of this kitchen is a Guild Anderson Original, a crisp, clean design where the coved detail and moulding around the frames have been simplified. It is a good example of how Guild Anderson are able to take a traditional feature and pare it down for a sharper and more contemporary feel. The bespoke plan for the project resulted in three outstanding original design elements for the kitchen: the pedestal breakfast bar table (see previous Blog post), the tapered central island, and the full height glass storage display cabinet described earlier in this article. Either side of the Aga is a set of wide drawers with dividers, planned in size order from top to bottom, for utensils and cutlery, followed by baking trays, and saucepans in the lowest drawers. Two symmetrical wall-mounted Bowman cabinets – a hallmark of many current Guild Anderson kitchen designs – bookend the cooking and washing up areas. Popular with clients, the tall Bowman cupboards keep appliances hidden but accessible and are also an elegant solution for a kitchen with low ceilings. Of the remaining cabinetry, the fridge freezer is intentionally raised off the floor – an everyday but important detail for a tall family – and framed in a bespoke run of hand-painted cabinetry. The appealing tapered shape of the central island came from the need for a generous space surrounding the large dining table nearby. This neatly avoided compromising the space where the corner of the island would have otherwise intruded into the dining area. Nick feels underestimating walkways or creating pinchpoints in the layout is a common error of otherwise good kitchen designs. The kitchen island’s storage space has been thoughtfully planned, cloaking on one side a ‘functional’ elevation for cookware and bins, while on the non-working side facing the dining room, the island acts as a traditional sideboard, providing cupboards and drawers for cordials, condiments, cutlery, mats and tableware. The island is topped in a Colonial White granite worksurface and hand painted in a deliciously rich Paint & Paper Library’s ‘Plum Brandy’. The new kitchen is well supplied with a broad range of good quality appliances for a family that truly like to cook: a Bosch dishwasher, a Fisher & Paykel fridge freezer and a Miele combination steam fan oven for the family who enjoy healthy eating. Two Fisher & Paykel zone induction hobs, either side of the 5-door dual control electric Aga, provide additional cooking for dinner parties as much as a safe area for hot pans. The Aga and double hobs are framed by the handmade cabinetry of a generous extractor hood and finessed with an antiqued silver mirror glass splashback. The cabinetry designed for this kitchen is distinctively Guild Anderson at its best: creative, practical and able to produce original and unique pieces of furniture as eloquently as everyday cabinetry. The individual items such as the glass display cupboard and the pedestal breakfast bar were important elements designed specifically for this project. The result is just a bit different, sets the tone and presents a beautifully balanced room. Agreeing with Laura, Melanie adds: “From an architect’s perspective, I knew that by handing over my client to Guild Anderson, they would be well looked after and be pleased with the finished design. You do need to pay to get something lovely – but it is good value for what you are getting by return. They provide everything you want in a kitchen but at a sensible and affordable price’.